1. To save the lost, cast out devils and heal the sick (Matthew 10:7-8). 2. He also said, some go not out except by Prayer and fasting (Matthew 17:21). People of Prophetic Power Ministries is an national & international ministry called to impact the nations of the earth with the message of Jesus, and touch every sphere of society including governments, businesses, media, arts and entertainment, science, education and the church. People of Prophetic Power Ministries does this by taking God's saving, healing and delivering power by the" Holy Spirit" to the nations and by apostolic consultation and prophetic insight to leaders in every sector of society with strategies from God for their success. We as a ministry feel the need to raise up an mighty army of prayer warriors from around the world – a network of believers coming together in unity to see God's plans and purposes for this ministry fulfilled, and to provide a prayer covering for this ministry. We believe in the power of prayer to establish the plans and purposes of God in this hour and see His Kingdom advanced. This army of prayer warriors is called "The POPPM Prayer Force." 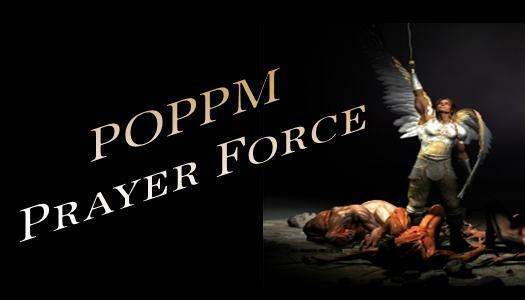 The POPPM Prayer Force army will provide covering for every part of the ministry including Family, the staff, ministry partners, those involved in the missions trips as well as our conferences and Street ministry. God continues to open incredible doors around the globe, and with those opportunities also comes the possibility of increased opposition by the enemy of our souls. Ezekiel 22:30 declares: "And I sought for a man among them, that should make up the hedge, and stand in the gap before me for the land." Intercessors around the world can help build a massive wall of spiritual protection and thus impact the work of this ministry in powerful ways. Intercessory prayer is where the battle is won and the victory is secured. It's where demonic forces are pushed back, and the Kingdom of God advances in supernatural power! We see this in Daniel 10:10-21 with Daniel praying 21 days until the breakthrough came in the spirit realm and heaven opened on earth. We also see the power of persistent prayer in I Kings 18:41-46 with Elijah's prayer for rain. He persisted in prayer seven times until the breakthrough came into manifestation on the earth. This same type of breakthrough persistent prayer is what we must partner together with to gethe results God wants the nations to have. We believe with all our heart that we are on the verge of the mightiest visitation of the Holy Spirit in human history. As a result of this glorious visitation, millions will be swept into the kingdom of God, the power of God will be unleashed for the miraculous as never before, and whole nations will experience the Father's love and be discipled. What a wonderful direction for united prayer! Jeremiah 33:3: "Call unto Me, and I will answer thee, and show thee great and mighty things, which thou knowest not." To guard, keep safe, watch over and protect the ministry through intercession. To keep People of Prophetic Power Ministries and Up Front in the Prophetic Radio staff, members, partners and the Fosdick family safe and protected from harm and danger (Psalm 91). To protect and preserve the anointing and God's destiny upon People of Prophetic Power Ministries. To build walls and boundaries of protection around the ministry from the attacks of the enemy (hedge in). To be aware—to be on the alert! God is giving us the ability by His Spirit to discern the plans of the enemy and to spoil these plans through intercession. To pray for protection over the harvest and to call them from the kingdom of darkness into the Kingdom of God. To release truth, strength and life into the ministry. To maintain the anointing, integrity, health and character of the Kingdom of God within the ministry. To call forth all of the provision, finances and resources to fulfill God's vision upon People of Prophetic Power Ministries. To cause doors of favor to open with key leaders and Heads of State in each nation People of Prophetic Power Ministries travels in order to disciple nations. To have media coverage in every nation to maximize Kingdom influence globally. To have favor with man so true national transformation can occur. You attend a church and have pastoral covering. You have a heart to pray and sense a release from the Lord to pray for this ministry. You have clean hands and a pure heart. You are living free from all offense, unforgiveness and bitterness. You desire to see His Kingdom come and His will be done. "Continue earnestly in prayer, being vigilant in it with thanksgiving." ~ Colossians 4:2 We are asking you to prayerfully consider becoming part of this prayer network to see His Kingdom come and His will done in the earth. We believe that when you become a prayer partner with People of Prophetic Power Ministries in taking the Kingdom message to the nations, the anointing, covering, blessings and fruit that God gives the ministry become yours also. Through your prayers, you can become an integral part of everything that God is doing through the ministry and receive the same reward—you become a joint partner in advancing God's Kingdom through everything we do! Jeannine Ouellette & Patricia Johnson are the prayer coordinators for People of Prophetic Power Ministries. With the power of the Holy Spirit, we will see the portals of Heaven open up and Salvation, Deliverance, Healings, Miracles, Signs and Wonders take place throughout the Nations of the World. " your obedience in joining with People of Prophetic Power Ministries. Together we will take back what is rightfully ours in Christ Jesus." of the world, for the last day move of the Spirit of God!" Taking the kingdom back by FORCE!